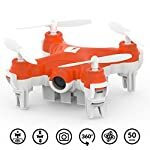 [HOW TO START THE DRONE ]: 1.When start to fly, turn on the quadcopter then turn on the remote, wait about 3 seconds till the light of the drone stop flashing. 2.Pull the left throttle 45 degrees toward the left bottom and pull the right joystick 45 degrees toward the right bottom at the same time, then the propellers will start spinning. 3.Click the One Key Take Off button, the drone will lift up to the air. 4.Click the One Key land to stop it . 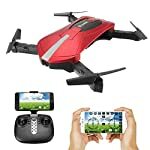 [WIFI FPV CAMERA ]: E52 foldable drone is equipped with wifi camera to take photos and videos while flying; supper wide angle shot to bring a new perspective to your photos and videos from the air; pictures and videos will be listed in the application and mobile album system. 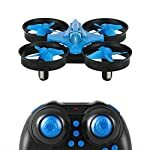 [ALTITUDE HOLD MODE]: When you release the left joystick(throttle) after the up and down operation, the drone quadcopter will still hover over the height when the joystick is released. ✓ FUN AEROBATICS & MANOEUVRES – The HC 625 is packed full of fun features like the automatic ‘360 Flip’ and Speed Controls. Due to it’s compact and small size, it has the added benefit of being perfectly suitable for both indoor and outdoor use. 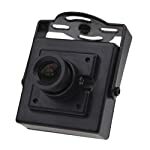 ✓ EASY TO CONTROL – The drone is very easy to control and use. The simple design and layout of the controller gives you easy access to all of the amazing features like the ‘Return to Home Function’ and ‘Headless Mode’! See the description for more details on all the features! 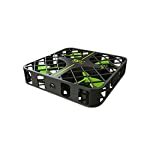 ✓ SAFE TO USE – Unlike other drones, our model has strong and sturdy anti-break propeller guards to ensure that it’s perfectly safe to use in the home, around children and the pet dog! New style,can better protect the fuselage with a folding frame. Compact and lightweight,technology-class skeleton structure,good-looking and funny,only 6.5cm side length. 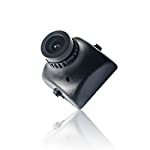 0.3 MP camera can shoot real-time beauty in the distance,real-time monitoring of the distance. 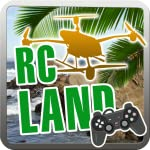 In the course of the game you`ll have to perform 24 riveting missions by using quadrocopter with FPV-system. There is also capability of over-island free-flight. 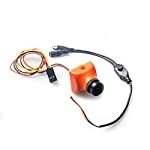 Excellent training will help you to save money on spare parts for real drone – quadrocopter (unmanned aerial vehicle). Type of drone control: joysticks, simplified joysticks, accelerometer and Gamepad. 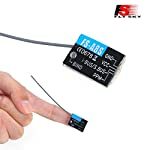 WORLD’S SMALLEST CAMERA DRONE! Only 1.6 inches wide you can take it wherever you go! The compact frame makes flying more precise than ever before with enough agility for even the tightest of spaces. FIRST SELFIE DRONE – No more selfie sticks or asking somebody to take picture! 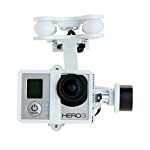 Flying HD Camera (1280х720) will capture all your friends, landscapes and flight adventures with HD quality without having to spend hundreds! WiFi & APP CONTROL – equipped with WiFi the drone can be alternatively controlled via the iOS or Android App connected to your smartphone or tablet. App. Pairing with the on board camera, the app gives a First Person View (FPV) of exactly what the drone sees.